Study Master of Physiotherapy (Graduate Entry) at the University of South Australia (UniSA). Information for International students. two courses each equivalent to 4.5 units* of human physiology at AQF Level 7 with at least a credit level (65%). The courses must explicitly include 30 hours of human musculoskeletal physiology. In addition, international students who speak English as a foreign language (regardless of prior learning in English) must have obtained one of the following standards within the last two years prior to admission. Possession of one or more of these standards, in addition to the academic entry requirements, does not, in itself, guarantee a place at the University of South Australia. Applications are considered on an individual basis and selection is competitive. Learn from experienced internationally-renowned teachers and clinicians. This master degree enables students who have already completed a bachelor’s degree or equivalent in a health-related area to meet the registration requirements to practice as a physiotherapist with just two years of extra study. 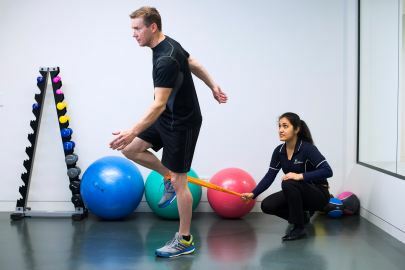 You will learn from registered physiotherapists and above world-class researchers1, and experience first-hand what it’s like to work in clinical practice in our contemporary physiotherapy clinics located on-campus. Practical experience will be further highlighted when you complete real-world clinical placements. These field placements are not only a practical way for you to apply what you have learnt during your studies, but are also a great way to build industry networks and relationships. Students must also be registered to practice physiotherapy in Australia. Applicants who are overseas trained physiotherapists and are eligible to apply for Australian registration with the Australian Physiotherapy Council are not eligible to apply for this degree. Applicants for this program must complete the Additional Information Form. 3. Students are required to have mandatory notification, CPR and a "Provide First Aid" certificate prior to commencement of their first placement or clinic activity. 4. Students will be required to satisfy the standard of dress and behaviour prescribed by institutions in which the clinical placements are undertaken. Failure to satisfy such requirements may prevent them satisfying the requirements for the completion of the program. 5. Credit will not normally be approved due to the accelerated nature of the program. 1. Students are advised that they may be required to spend time in a clinical placement outside Adelaide in a country or interstate location. 2. Students will be required to undertake clinical placements outside normal University teaching weeks. UniSA has over 40 years' experience in physiotherapy education, and are proud of the rich knowledge base we have created. You'll develop the capabilities to assess, treat and prevent human movement disorders, enabling people to lead more functional lives. You will learn from registered physiotherapists and clinicians, with a curriculum informed by well above world-class research in Clinical Sciences1, and experience first-hand what it’s like to work in clinical practice in our contemporary physiotherapy clinics, located on-campus. Practical experience will be further highlighted when you complete real-world clinical placements within a variety of metropolitan, rural and regional health settings.